I live in an apartment with all white walls and quite a minimal style, but there's one thing that I'm stuck with and can't afford to change - the ugly aging beige intercom handset. I've given a lot of thought to how I can hide or disguise it, to no avail. 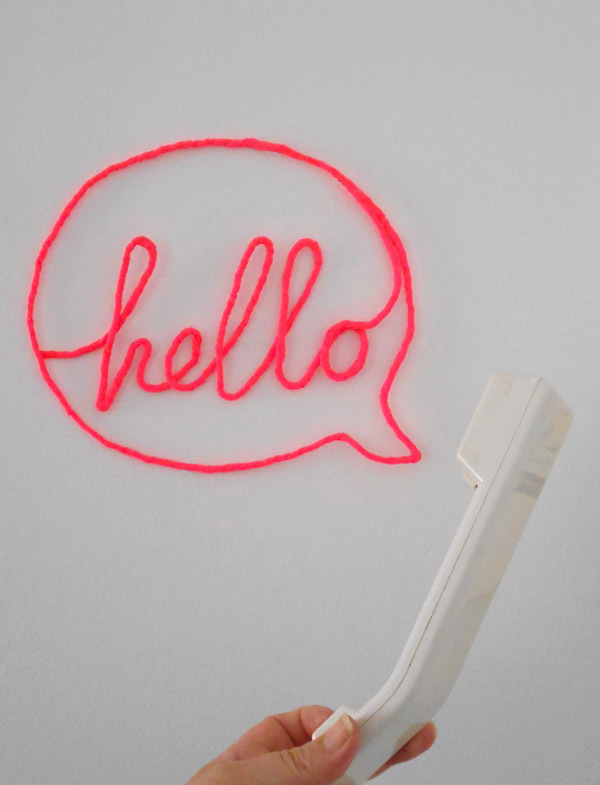 So I came up with a solution: instead of trying to hide it, I decided to create this neon wrapped wire speech bubble to place right next to it. Now the handset doesn't stick out like a sore thumb anymore, it's become part of a fun art piece. This tutorial is quite easy: using fabric to wrap the wire is faster and easier than thread or yarn and wrapping the wire before shaping it makes it fast and not too fiddly. Stretch fabric cut into strips about 1.5cm (just over half an inch) wide and roughly about 40cm (16 inches) long. Download and print out the hello speech bubble template. Click here to download the template. Unwind the wire and as you do, run it through your hands to straighten it. Make sure there are no small kinks in the wire. Cut a piece that measures 175cm (69 inches). Start winding the fabric diagonally down the wire. Add a small dot of glue every 7.5cm (3 inches) to hold the fabric in place. When you've used the whole fabric strip, run a line of glue down the wire to hold the end in place. When it's dry, trim off the end of the fabric parallel to the wire. To add a new piece of fabric, just lay it under the wire on a diagonal and run a line of glue to attach it. 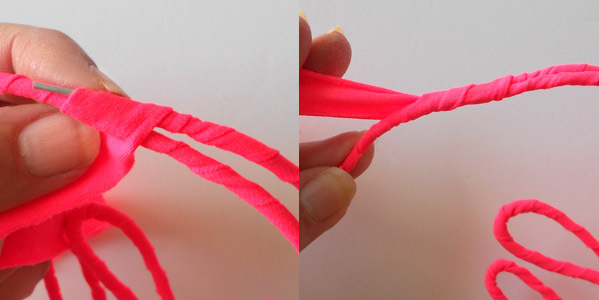 Fold over the short end and start winding the fabric down the wire. Continue adding new pieces of fabric and winding them on until you are about 2cm (almost one inch) from the end of the wire. 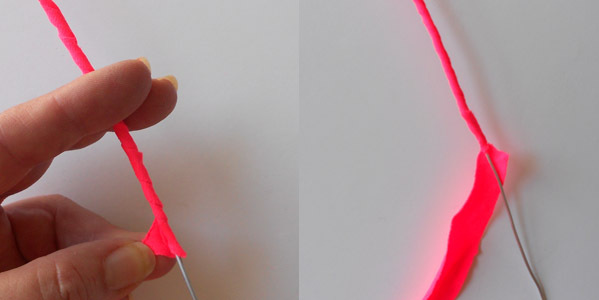 Run a line of glue along the wire to secure the fabric. Don't cut the fabric off, you still need to have a tail of fabric at least 4 inches long to join the two sections of the speech bubble. Lay the printed template on the table and starting with the 'h', bend the wire to form the letters. The craft wire I used was very soft and pliable and I didn't need to use pliers, but if your wire is stiff you may need them to help bend the wire to form the shapes. Your wire word doesn't have to match the template exactly, it's just a guide. Continue bending the letters into shape, laying the wire down on the template to check your progress and adjust the shapes as you go. When you get to the 'o', bend the wire up and around the top of the speech bubble, following the template. Smooth out any small kinks as you go so that the speech bubble has large round curves. Bend the wire around the bottom and back up until the end meets up with the beginning. Place the end of the wire under the speech bubble and wrap the fabric tail around the two pieces of wire to join them together. When you've covered the end of the wire, run a line of glue on the underside of the speech bubble to attach the fabric. Then trim the end neatly parallel to the wire. 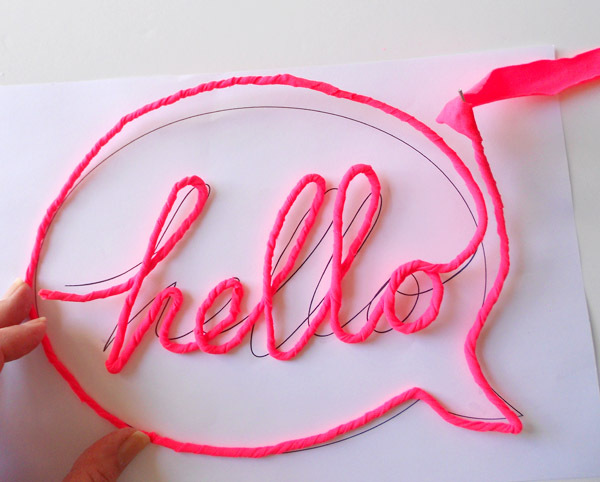 With a small dot of glue, attach the beginning of the 'h' to the back of the speech bubble. I found the letters stayed in position without further gluing, but you can also add dots of glue to join the wire where it crosses. Depending on your wall surface you can attach your wire-wrapped word with small pieces of Blu-Tac, small 3M hooks or washi tape. 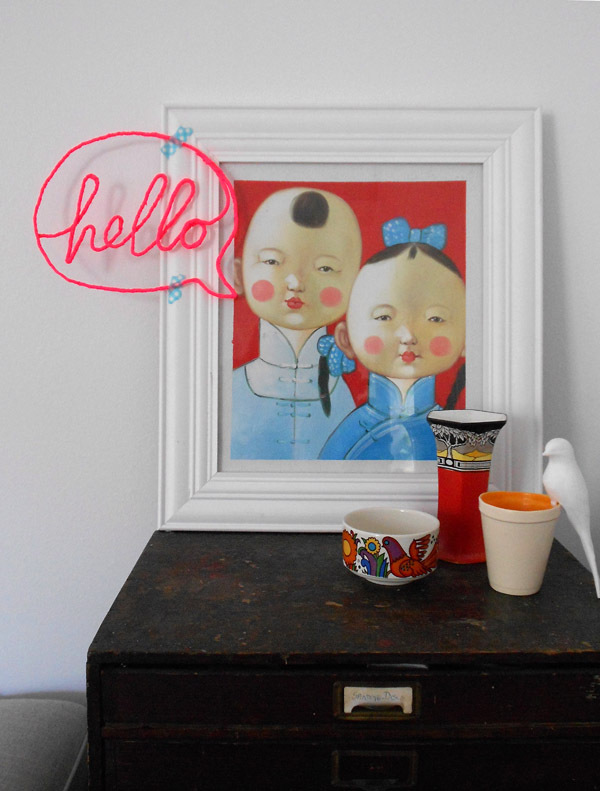 These speech bubbles also add humour to paintings and portraits. Try making other words and get a conversation going. Hello! I’m a designer, maker, blogger and a sometime-stylist. I’ve always been drawn to creative expression and I love making, crafting and being surrounded by beautiful things. I design sewing patterns and kits as the red thread and I'm always making or thinking about creating the next craft project to share. 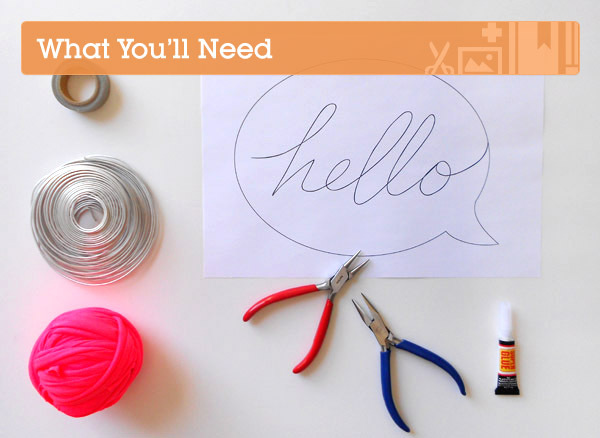 My blog the red thread is all about sharing things I find and craft tutorials I create. My digital magazine, SCOUT, is all that and more. 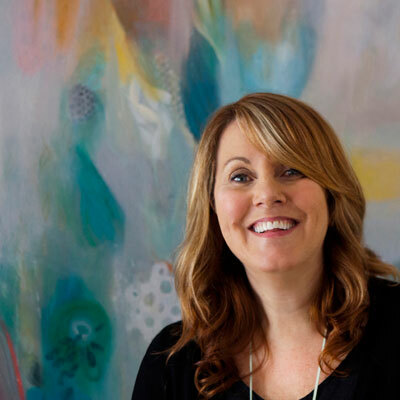 It makes me happy to think that I might inspire others to live a more creative life too.